This is the post where I pretend to know everything that happened last night in regard to our mama cat, Wiggams. If she were to share her birth story, I’m sure it would be almost identical to the words I will write to share with you. This, from the one who knows nothing about cats and didn’t even want a cat or any kind of pet until late July when Wiggams showed up and took over our porch. What can I say? She’s a sweet cat. And she eats bunnies. Love her. Well, said sweet cat had been getting wider by the day (and not from eating bunnies). All day Thursday I felt she was moving slowly and sluggishly. Basically it reminded me of how I felt right before giving birth. Obviously, I could relate to Wiggams since cats and humans are almost exactly the same with so few differences. Hmmm, I wondered. Baby time?? We gave her some extra love and re-washed the towels we’d put in a box for her. Wiggams was less than okay that I didn’t move to get up. She responded by meowing again and slamming her front paws onto my office window screen, looking at me with wild eyes. “Get out here, NOW!” she screamed. I promise. I’m not making this up. I left my chair and went outside. She meowed and rubbed up against my leg, then tried to crawl up my leg, then meowed loudly again. All the while, I was gently rubbing her back. She got sad anytime I stopped rubbing, so I kept rubbing. Dude, I never wanted anyone to touch my back when I was in labor. Maybe cats are different from humans after all. Suddenly she bristled, which I took to mean, get your hand off my back. Okay then. You’re done with the rubbing. I get it. Don’t touch the back. I ran back into the house and up to the dryer to get the clean towels, ran back outside and put them into Wiggams’ box, then walked Wiggams to the box. I put the box in a little cubby under our porch and told her, “Hey, if in fact you’re getting ready to have those kitties, this is the perfect spot. Clean towels, cozy environment…and conveniently we’ll know where to find you and the babes.” Yes, I really did say all of those words. I was certain she understood. Just call me Dr. Doolittle. She was done with me at this point, so I went back to work in the house. I told Matt and the boys about Wiggams’ weird behavior and said that I wouldn’t be surprised if we had baby kitties the next morning. Just kidding. That’s just mean. The next morning, I was getting ready to head to Lincoln again for a follow-up doctor appointment for our sick boy. At ten minutes before departure time, I heard a knock at the door. There stood our next-door neighbor, cautiously (so that the boys wouldn’t hear or see) letting me know that he’d found a baby kitten on a cement pad on his property. It hadn’t survived. What would he like me to do? He didn’t want our boys to be upset. Side note: This neighbor has been so kind to Wiggams ever since she showed up here. He is the first to get to pick a kitten (we had already arranged this), especially after all his extra kindness today. Knowing that Wiggams and (hopefully) more baby kitties were somewhere out there, several of us bundled up and searched all over our property and our neighbor’s. Suffice it to say that I am not the Cat Whisperer that I claimed to be the night before. Wiggams certainly hadn’t taken me up on the box with towels plan. Or any of the other logical suggestions I’d made for potential birthing centers. I had to stop my search to head out of town for the doctor appointment. We all figured Wiggams would come out of hiding when she was hungry. The day commenced. Our neighbor had finally found them. They were (of all places) in a trashcan full of sticks and debris on our neighbor’s property. I couldn’t get home fast enough. Sweet, sweet, baby kitties! As far as we can tell at this point, there were four kittens total. Two did not survive. 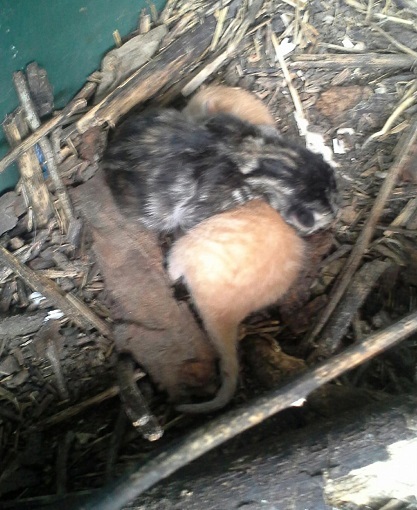 Two are safe and snug…with their mama in a pile of sticks in a trash can. I have to continue to remind myself that cats have had babies for thousands of years without my help and that Wiggams is fine. I have asked her several times if she needs anything. After all, after I had my babies I needed people to bring me food and slippers. I just did. Right now, she’s pretty much like – Back off. I’ll see you in a few days. 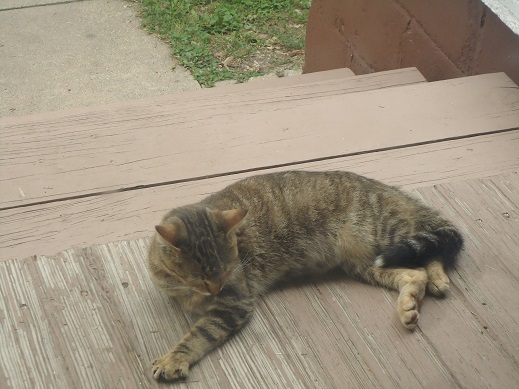 She found her way to our porch this afternoon and ate an enormous amount of food. This was comforting to all of us. I look forward to sharing more with you as I learn more. I’m sure that once Wiggams is up for it, she will give me all the details. In the meantime, we’re coming up with names for the two kittens. The little gray/black one is Neymar (named after Neymar da Silva Santos Junior, a professional Brazilian soccer player). We’re considering Lionel for the little ginger-colored kitten (after Lionel Messi, pro Argentine soccer player). By the way, some pro soccer players we love really don’t have good cat names. Not criticizing. Just saying. Also, it’s possible we all take kitten naming way too seriously. Stay tuned for more of the cat drama at our house. As Asa (our college freshman) said as I texted him throughout the day with updates, “I feel like there’s an episode of Curious George going on at our house today.” Yes. That describes this day perfectly. I may have to get myself a tall yellow hat. Love the story! Whatever you do, don’t try to make Wiggams change where she is keeping her babies (it won’t work). She’ll probably raise them on those sticks for awhile, because that what she wants. Who knows why? The towel box sounds much nicer. Awwwww…this is such a darling story! And you continue to crack me up—thanks for that, too.